So, you mean to tell me that’s not a unique workout?! But let’s be for real, how many of us can relate?! Well what if we told you that there are workouts in Durham that make you want to get out of bed in the morning or make you forget that you are even working out? Yep, they exist and they’re so much fun. Good things come to people who sweat. As of now there are only two Sync Studios in the country. Brooklyn, New York is home to one of them and Durham is lucky enough to have the other. Yoga, cycling, wellness and social all in one place? Yes, please! Sync Studio Durham is not just a fitness studio, it’s a community where all aspects of wellness “sync” up. Attending one of their cycling classes is like going to the club but you don’t have a hangover the next day. The energy and vibe of the class is a dance party on wheels with a beat driven aspect and hair flips included. Get your Beyoncé on while you get your workout on! Did we mention Sync Studio is a human buffet of exercises? From yoga, to circuit training to cycling. These classes aren’t your average exercise classes; each one comes with a unique twist. Whether it’s doing yoga or a circuit class to the beat of a new song that just came out or beginning your workout with high energy and ending in savasana. Sync Studio is more than just a place to work out, it’s a community. Everything they do is to build a Durham family by getting together post class at a local brewery to having events like “Sync in the Park” at the Durham Bulls Athletic Park and “Bend and Brunch” at Unscripted Studio. Become part of this unique community with a unique workout at Sync Studio! You’ll be hooked! Also, use your Shop Durham card to get 10% off on a Single Class Drop-In, 5 Class Pass, 10 Class Pass, and the 20 Class Pass. So many different offerings in one cube! Come as you are, be who you are in a space to dance your heart out in a Zumba class or challenge yourself in Suspension Training, Yoga, Barre or Pilates. Leave feeling better than when you came in! Fitness @ The Cube is a welcoming community of all ages that allows you to get out of your comfort zone and have fun while breaking a sweat! Their tribe of trainers are passionate, professional, extremely knowledgeable of their craft and accommodate you to whatever you need to work on or stretch. Start your day by shaking your tail like Shakira in one of their Zumba classes and finish your day in a positive mood mentally and physically shaping your body in a Pilates or TRX class. 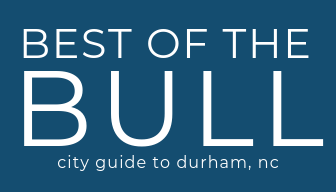 Located by Duke in between Durham and Chapel Hill, Fitness @ The Cube is a fitting name for the outside of the studio. Downstairs you will find a group exercise area and upstairs is a space for private or small group classes involving specialized equipment. Need to stretch that hip out or having back problems lately? Then the Pilates Reformer Class is the perfect place for you! There’s no such thing as a boring workout in Durham. Check out these unique workouts that we love!